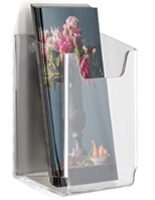 This plexiglass brochure holder is an acrylic flyer pocket that mounts to a wall. Each literature display is made with quality acrylic that is suitable for any type of indoor environment. 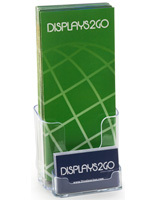 The brochure holder features a clear design that offers an unobstructed view of the displayed pamphlets. 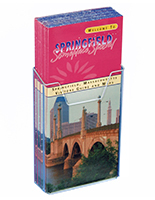 Most literature is printed on 4" wide material, making this single pocket holder the ideal choice to display flyers. Each brochure holder, also called a literature pocket, features a small cutout on the front panel to allow for easy removal of a flyer. The high front panel also aids in keeping single sheet literature upright. 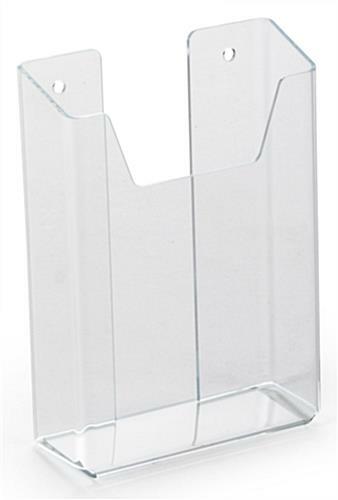 Use this pamphlet pocket, brochure holder to offer free literature, credit card applications, or other informative pamphlets in a public building. 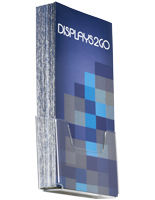 The low price point of this clear acrylic display is ideal for companies that need to purchase large quantities to outfit all of their locations. 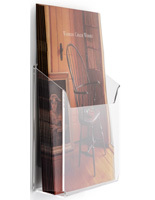 Each brochure holder that is clear acrylic features two pre-drilled holes for wall mounting. Hanging hardware is not included; however, users can choose to hang with included double-sided sticky pads. 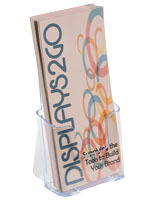 This brochure holder is 1-1/2" deep allowing for a generous amount of literature to be displayed. Banks, convenience stores, restaurants and grocery stores are just a few of the types of businesses that purchase this pamphlet pocket by the hundreds. 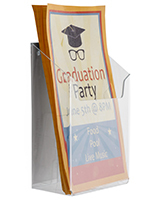 Customize this brochure holder with a logo or corporate slogan for a more personalized and professional look. Exactly what we needed. Thank you! Very happy with the look and size of these clear rack card holders. Loved that they came with double stick foam tape. Easy to adhere, so didn't need to screw into the wall. Thanks for sharing your photo! Feel free to share the photo on our Facebook wall too! We love it when our customers show off their products "in action!"